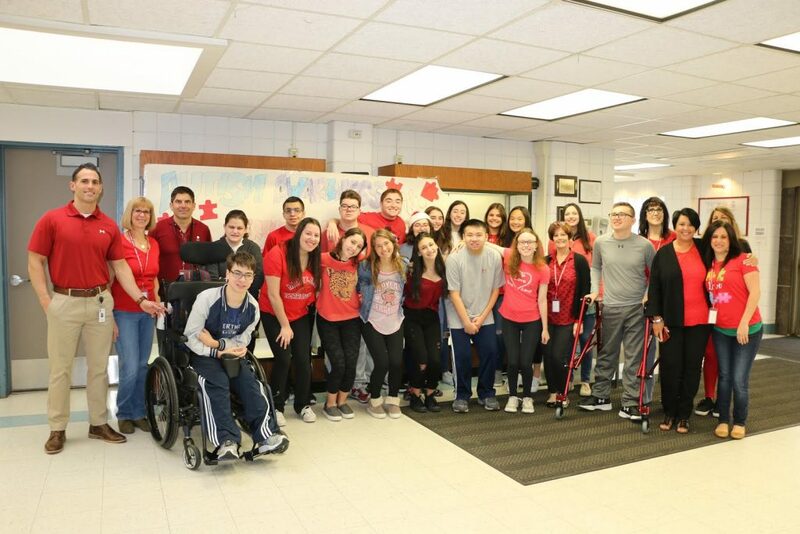 Once again, Syosset High School is honoring National Autism Acceptance Month. Members of Student Government, along with student and staff members, decorated the main hallway of the high school with red streamers, balloons, puzzle pieces and banners. Every morning for the week of April 9, a fact about autism spectrum disorders was read during the morning announcements, including the mention of famous people living with autism. And on Friday, April 13, students and staff wore red and were given stickers to wear that displayed the autism ribbon to show their support and commitment to promote awareness and acceptance of individuals on the spectrum. The color red was chosen as it is a symbol of love. Special thanks to all of the students and staff who took part in the events throughout the week. Photo caption: Joined by students who participated in Syosset High School’s National Autism Acceptance Month activities are (left to right) teachers Greg Cardona, Sue Botta, Gary Silverman, aides Carolyn Sullivan and Barbara Orvieto, Director of Pupil Personnel Services Mary-Lou Sapienza, teacher Dale Iovine and aide Donna LaMonica.